Some viruses can cause their genetic material to be pemanently stored in the human genome -- even getting passed on to offspring. Endogenous Retroviruses, for example are thought to make up between 5~8% of the human genome. Does stored viral DNA present in an otherwise uninfected human being's (a newborn baby for example) genome ever get used to spontaneously manufacture new virus bodies, thus infecting the host, and causing them to suddenly become contagious without ever having encountered an actual virus? Put differently, is it possible that a human being harboring viral DNA and quarantined in a sterile enclosed environment (bubble, etc) preventing any contact with external contaminants (viruses), could ever spontaneously become infected with a virus, due to the stored viral DNA getting expressed? It sounds like you're referring to the transition from the lysogenic cycle to the lytic cycle. The lysogenic cycle involves the viruses' DNA being integrated into the host's genome, such that the host has a dormant infection, the lytic cycle involves the virus' DNA being transcribed and translated to make the components of viruses, like capsid proteins, which then self-assemble to form many viruses which then leave the cell. The fact that this transition can occur means someone can experience an active viral infection, with proliferating virus particles, without exposure to additional viral contaminants. If it couldn't, then would there be much point (from a virus' perspective) to the storage of viral DNA in the genome which, as you've noted, retroviruses can do? 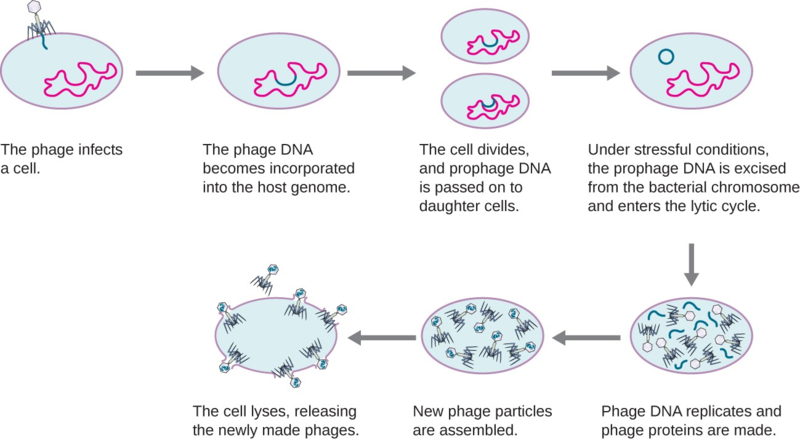 To use the lambda phage (which is a bacteriophage and thus infects bacteria, not humans, but the underlying principles are the same) as an example, the expression of the viral DNA is controlled. But, the viral DNA is not a monolith - parts of the viral DNA of a prophage (the genetic material of the bacteriophage integrated into the bacterial host genome) are expressed but their expression prevents the expression of those parts of the viral DNA which would cause a transition from prophage an active infection, i.e a switch from lysogeny to the lytic cycle. 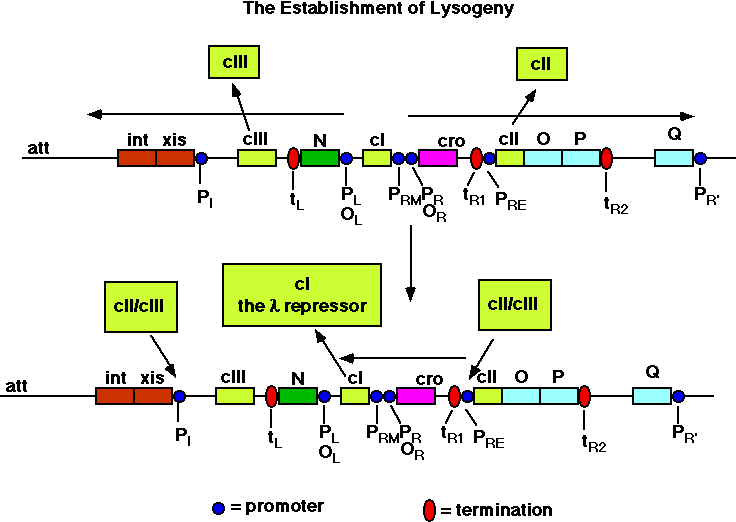 There's lots of stuff going on here, but the key point is that lambda repressor, a protein coded for by the yellow cI gene, represses any transition to the lytic cycle. Aside: cI stands for clear I, because virus mutants which don't have c1 go straight into the lytic cycle and so produce clear spots on agar plates of bacteria since the bacteria are straight out killed rather than hosting the virus in the prophage form. The lambda repressor prevents the transcription of the genes under those arrows in the top part of the diagram, and it's those genes which code for the things required for active virus particles, such as enzymes required to rupture the host cell's wall, and the proteins required to form the virus' coat. So, to sum up, yes. Viruses existing as viral DNA embedded in the genome can cause infections, even in individuals not exposed to additional contaminants (but contaminants which cause damage to the host's DNA, like mutagens, will trigger the transition from lysogeny to lytic), and some of the viral DNA is always expressed (repressor genes) in order to prevent the expression of the parts of the viral DNA which would cause an active infection, were they to be expressed. Not the answer you're looking for? Browse other questions tagged dna virology human-genome retrovirus or ask your own question.